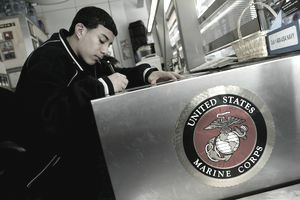 The ASVAB - Armed Services Vocational Aptitude Battery is used by all branches of the military to determine aptitude and general academic ability of recruits. There are a few segments of the ASVAB that are heavily weighted. Knowing that your Verbal Expression (VE) score as well as your AFQT score are significantly weighed will help recruits determine the areas they need to prepare well if they want certain jobs in the military. The Armed Forces Qualifications Test (AFQT) score is derived from four areas of the ASVAB: Basically, Reading, Writing, and Arithmetic. The Paragraph Comprehension subtest of the ASVAB consists of 15 multiple choice questions, which must be answered in 13 minutes. It is a bit different than typical reading comprehension tests that you maybe used to in school. This is a very short paragraph of a few sentences and requires you to pay attention long enough to thoroughly understand the details of the section of reading. The questions vary in all subjects from science to history. The Word Knowledge (WK) - subtest requires the recruit to identify the meaning of a word (synonyms); occasionally antonyms (opposite meaning of a word) - includes 35 items that are to be completed in 11 minutes. This is a fast paced test that are typically one word questions and answers. Your knowledge of English is critical for this subtest. Having some experience with Latin is never a bad idea when learning words, definitions, and roots as the Latin words make up a large part of the English language (and others). The Verbal Expression, or VE Score is one of the most important scores on the ASVAB. Not only is it used in computing the AFQT score, but it is also used by the services for computing many of the line scores used for military job qualifications. To compute your VE score, the military adds the standard scores of your PC and WK, and then compares it to a chart very much like the one below. A Note About Standard Scores. The standard scores are simply number correct. There are 35 Word Knowledge questions on the ASVAB and 15 Paragraph Comprehension questions, for a maximum possible added score of 50, which would equate to a VE score of 62. There are a few different versions of the ASVAB with different number of questions but cover all the nine sub-tests of the ASVAB. You will first take the ASVAB in high school - for many people. It is a paper version of the test. If you take it in your recruiter's office, you can take the computerized version. Ninety percent of the people who take the computerized version are doing so with the intent to enlist in the military, however there is a paper option the recruiter can give also. Since the ASVAB determines what jobs you can or cannot do in the military, military members can also take it again to tryout for other jobs in their branch of service if they did not score high enough the first time. If you truly want to serve in the military whether to learn a skill or make it a career goal to serve and retire, your ASVAB scores must not be taken lightly. If you want to perform at a high level within the military, your abilities on this test must be well represented.